After lunch, the river was pretty windy and got worse as the day went on. It seemed like we got through Minneapolis pretty quickly and now have been going through Saint Paul for awhile. In Saint Paul, we saw a lot of barges (all but one were parked on the sides of the river), a touristy steamboat, a tug boat, and multiple recreational boaters. It just felt very busy and noisy, and made SweetPea a bit nervous…it didn’t help that the wind was getting pretty fierce as well. As we passed by different factories, there were some pretty unpleasant smells, which only made us want to paddle faster to get away from them. We ended up stopping early at 4:30pm, because the wind was just too much. It is not easy to describe how hard it is to paddle in a big river with strong winds. It is especially hard and tiring for Beardoh, because there is a big difference in our strength levels. He has to work double to keep the canoe going in a mostly straight line. We are camped in another park tonight (probably also not a legal site). We had a nice relaxing evening sitting on the sandy shore, and now we are all in bed by 7:30pm. We remarked today that we have never been so consistently wiped out at the end of the day as on this trip…the river continues to demand all of our energy everyday. It was warm enough last night that we didn’t even use our underquilts on our hammocks…that is a first for us. We still managed to sleep really well in the heat, a benefit to using a hammock. The first half hour of paddling this morning had really strong winds, which worried us for the rest of the day. Luckily, the wind was intermittent during the day. We had some calmer water to paddle through at times. The morning was pretty quiet on the river, with just a few other boats. We have been noticing the start to fall lately, with some of the leaves starting to change color. There has also been a bit of scenery change in the past two days, with some rocky bluffs along the edges of the river. We had another lock to go through in the late morning. We had to wait about 20 minutes before we were able to go into the lock, since there was a boat which had gone though just before us. This lock only went down 11 feet, so it was quick to get through it. We stopped for lunch at a marina just after the lock. It was a nice break and we enjoyed chatting with the lady running the store and deli. After lunch, the river really got busy. The barges are currently our favorite watercraft to encounter. They are going slow and produce only a small wake. The motorboats and luxury boats however, we really hate. They go really fast and often unnecessarily close to us, leaving us scrambling to turn our canoes in order to take their giant wake head on. Sometimes the wake can be four feet and is a bit unnerving. The river is now marked with buoys which show the navigation channel. We generally try to stay out of the navigation channel, or right near the edge, but since the navigation channel moves from side to side, that means that we are zig zagging across the river. It definitely slows down our progress, as does handling the wake from the fast boats. 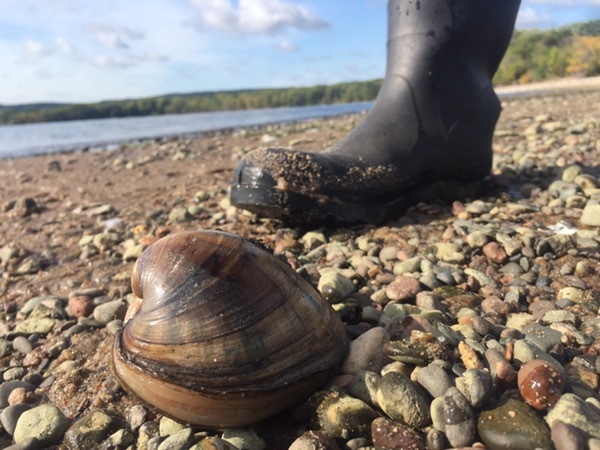 There is certainly a lot more we need to be aware of on the river now. We found a spot to camp just after 5pm. It looks like we might get rain overnight, so we have our tarps up. The heat is supposed to be letting up a bit tomorrow, and we are looking forward to a short day into Red Wing tomorrow. We are going to be meeting up with Beardoh’s mom, which will be good. Today we made a big milestone on the trip…instead of MN being on both sides of the river, we now have WI on our left side! Slowly but surely, we’re making progress. Well, the rain came just after 5am along with a lot of thunder and lightning. It didn’t stop until around 7am, so we stayed in our shelters until then. We figured it wasn’t safe to be on the river in the storm, so we ended up leaving an hour later than normal. The river was pretty quiet this morning as we paddled almost five miles to our next lock. When we arrived, we found out that a barge was currently being locked through and we would need to wait an hour and a half before the lock would be available to us. We were bummed, because we were hoping for an early arrival into Red Wing today, but there wasn’t much we could do. There wasn’t a place for us to get out of the canoes to wait, so we just sat on the boats and either read or listened to a podcast. Once we were finally in the lock, we were surprised to only be lowered about five feet. At least it went quickly and then we were on our way again. We made it to town by 11:30am and went straight for the marina where we planned to camp and shower. We had time to clean up and get some chores done before Beardoh’s mom, Bonnie, arrived. Then we hit the town for food, laundry and groceries. This is the first time that we have been doing an adventure any where close to where Bonnie has been, so it was great that she could come down and spend the afternoon with us. It is nice to have an afternoon off from paddling, but we also realize that we need to start increasing our daily average some. 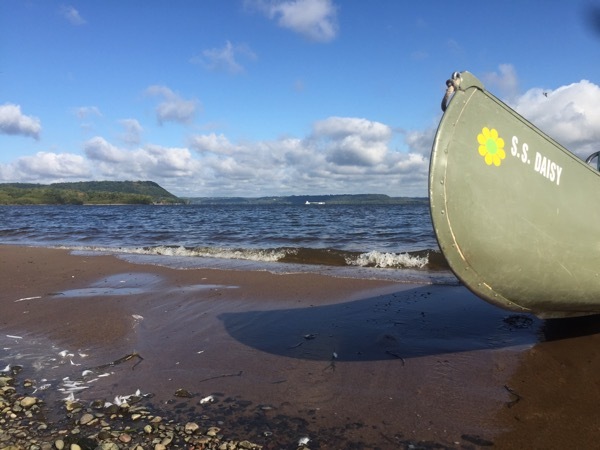 Tomorrow we go through Lake Pepin, which is a really long (20ish miles) lake which we hear is quite popular on the weekends. Since tomorrow is Sunday, we expect to encounter a lot of boats. We plan to get an early start to avoid as much recreational boat traffic as possible. 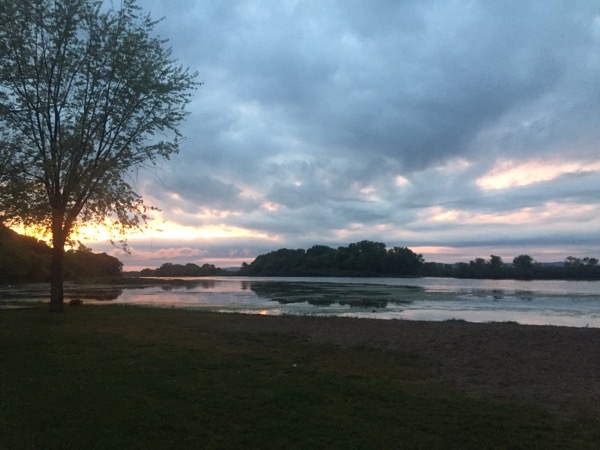 Hopefully the cooler temps predicted for tomorrow will also keep folks away from the lake. Luckily things were pretty quiet at the marina last night. There were multiple trains during the night, but that seems to be standard these days. Earplugs have become very necessary over the past week with car traffic, trains and bugs. The railroad tracks border both sides of the river and will probably stay that way for awhile, so there is no escaping the noise of the trains. We got started just a few minutes earlier than normal…we got up 20 minutes earlier, but we had to get the canoes back down to the water and re-packed so that took a bit of time. It was really nice and calm on the water early in the morning. This time of day continues to be our favorite, with the early light and calm waters…and we usually have the river to ourselves, which we like. 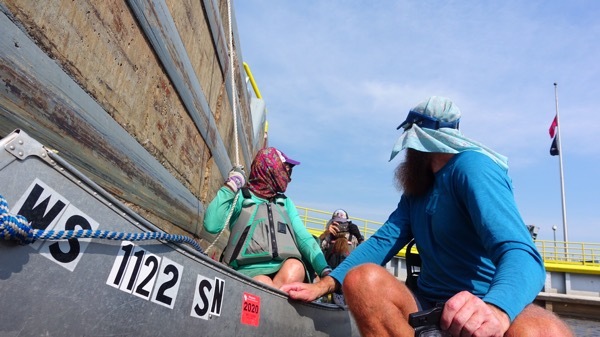 In the morning, we had an encounter with a tugboat (Qball called it our near-death experience, which was pretty funny)…we were out of the navigation lane and were coming up to some barges parked on the side of the river. A tugboat came around from behind the barges and started coming towards us. We stopped paddling to see which direction he would turn. Then he blew his horn at us and we turned closer to the navigation channel and out of his path. Although it made SweetPea nervous, we were never very close to the tugboat, but Qball said from their vantage point behind us, it had looked like the tugboat was right in top of us. That was our big of excitement for the day.  A big part of our day was spent crossing Lake Pepin. We were super lucky with the wind today, as it was to our backs. It was actually a bit weird paddling with the wind in that direction, because it felt at times like we were surfing the waves. It definitely created new steering challenges for Beardoh, but we were really happy not to be paddling into the wind. When we met up with Bonnie (Beardoh’s mom) yesterday, we made a few gear changes. Most notably was that we got rid of our wind sail. We have been disappointed with the fact that we haven’t been able to use it. We just seem to be paddling into the wind all the time, but even on a day like today with favorable winds, they probably would not have been strong enough to really use the wind sail. We also both got waterproof phone cases, with the hope of having them out more and therefore taking more photos. Beardoh also got new shorts, and subsequently a sunburn on the small strip of leg that was previously covered by his old shorts. At lunchtime, we looked at the mileages and realized that we could make it to Alma today, which is where a college friend of Beardoh’s lives. We called up Bryan and he was up for having us at his place tonight. So, we paddled steadily the rest of the afternoon and went through the lock in Alma without much delay. 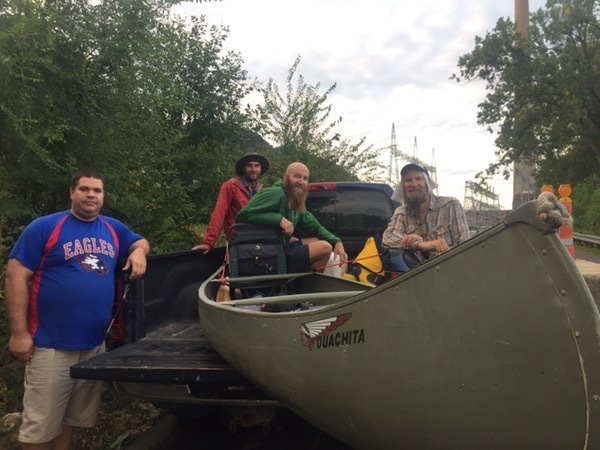 We met up with Bryan just after the lock and he transported us, our gear and our canoes back to his place. We all got showers and Bryan made us a great dinner with dessert. It was great to spend time with Bryan and he really went all out for us. Today was our biggest mile day so far!